Children who read tend to learn more vocabulary, write better stories and may even spend less time playing on electronic games than those who don't.The books on our site are all chosen by children. These are the books that children tell us are the best ones, the books that they really, really want to read. We have hundreds of recommendations for 2-5 year olds, 6-8 year olds and 9-11 year olds as well as books that are suitable for children aged 11+. 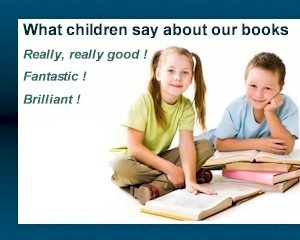 We give you an idea of the age a book is suitable for, but we do rely on parents to make the final decision about whether the content is suitable for their particular child. There are special sections of books suitable for struggling readers (books with a lower reading age) and advanced readers (books with a higher reading age) as well as books for reluctant readers who think they don't like reading. We have stories that you can read to your child as well as books they can read for themselves, whether they are avid readers or reluctant readers. To guide you in your choice of books, we have just introduced a series of reading levels to help you decide how easy/difficult a book is to read. At the present time we are still rolling this programme out, so if you cannot see a particular book's reading level, please feel free to contact us.